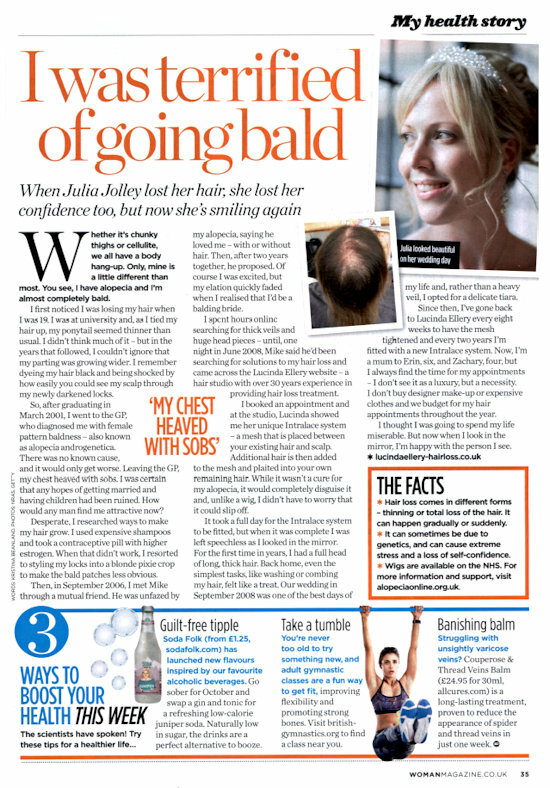 When Julia Jolley lost her hair, she lost her confidence too, but now she's smiling again. Whether it's chunky thighs or cellulite, we all have a body hang-up. Only mine is a little different than most. You see I have alopecia and I'm almost completely bald. I first noticed I was losing my hair when I was 19. I was at university and, as I tied my hair up, my ponytail seemed thinner than usual. I didn't think much of it - but in the years that followed, I couldn't ignore that my parting was growing wider. I remember dyeing my hair black and being shocked by how easily you could see my scalp through my newly darkened locks. So after graduating in March 2001, I went to the GP, who diagnosed me with female pattern baldness - also known as alopecia androgenetica. There was no known cause, and it would only get worse. Leaving the GP, my chest heaved with sobs. I was certain that any hope of getting married and having children had been ruined. How would any man find me attractive now? Desperate, I researched ways to make my hair grow. I used expensive shampoos and took a contraceptive pill with higher estrogen. When that didn't work, I resorted to styling my locks into a blonde pixie crop to make the bald patches less obvioous. Then in September 2006, I met Mike through a mutual friend. He was unfazed by my alopecia, saying he loved me - with or without hair. Then after two years together, he proposed. Of course I was excited, but my elation quickly faded when I realised that I'd be a balding bride. I spent hours online searching for thick veils and huge head pieces - until, one night in June 2008, Mike said he'd been serching for solutions to my hair loss and came across the Lucinda Ellery website - a hair studio with over 30 years experience in providing hair loss treatment. I booked an appointment and at the studio, Lucinda showed me her unique Intralace system - a mesh that is placed between your existing hair and scalp. Additonal hair is then added to the mesh and plaited into your own remaining hair. While it wasn't a cure for my alopecia, it would completely disguise it and, unlike a wig, I didn't have to worry that it could slip off. It took a full day for the Intralace system to be fitted, but when it was complete I was left speechless as I looked in the mirror. For the first tiime in years, I had a full head of long, thick hair. Back home, even the simplest tasks, like washing or combing my hair, felt like a treat. Our wedding in September 2008 was one of the best days of my life and, rather than a heavy veil, I opted for a delicate tiara. Since then, I've gone back to Lucinda Ellery every eight weeks to have the mesh tightened and every two years I'm fitted with a new Intralace system. Now I'm a mum to Erin, six, and Zachary, four, but I always find time for my appointments - I don't see it as a luxury, but a necessity. I don't buy designer make-up or expensive clothes and we budget for my appointments throughout the year. I thought I was going to spend my life miserable. But now when I look in the mirror, I'm happy with the person I see.